Pumpkin Gutter - Page 6 - Zombie Pumpkins! TBH, I use a corded on lower power, more heft & grunt as required without straining the motor. I hooked it up to my Lithium Ion battery drill (only 14v , enough for most jobs when you have both types, however nowhere near enough heft to power the pumpkin gutter. So nip to b&q for a cheap "challenge" type or borrow a neighbours corded as a good power drill is £80 - £150. Drills are always handy to have. Edinburghzombie wrote: What kind of drill is best to attach the gutter to? If you don't already have a drill, I'll assume you don't have a lot of other uses for one. I use a DeWalt cordless drill, but they're fairly expensive. If you are on a budget, borrow a drill (if you can) or find an inexpensive corded drill or fairly powerful cordless drill. Good luck, have fun, and let us know how it goes! Thanks for the advice folks. I don't really have much use for a drill outside the gutter, so I think I'll borrow one. However I wil still go to B&Q because I like to look at the tools MANLY! good will/thrift store might be a good place to check out? 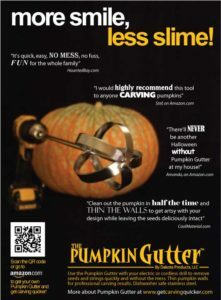 Discovered that my friend has a drill that I can borrow Pumpkin gutter for me this year! Dredge wrote: I just ordered mine! EZ, list, remember the gutter rules for thinning have a test poker to hand when thinning to ensure optimum depth is achieved on your walls with a warren pro blade or similar..
My kin walls were so thick the other night I stupidly had to thin 4-6 times..
very happy big hounds, so if not cooking, not necessarily destined for the bin! I find my pumpkins last longer with thick walls. yes, it's logicall but easy to forget (ahem ) I was using Izzy to hold the kin for the initial guttling simply wearing a air of latex gloves, if you think about it a drill gets covered with all sorts of muck, mines red from brickdust etc, despite cleaning, so not introducing contaminants to the mix is important to me..
by simply pulling the majority of the seeds out by hand in the initial, we got precisely 1 tiny stringy thread around the gutter arm,nothing bad.. so depending on what you want to do with the seeds (less sorting if you take the initial lot out & dump em in a pyrex bowl) then I tip the accumulated wall trimmings on a tray as I go & cook off briefly in the microwave with seasoning .. There's nothing like having to gut by hand o really make you appreciate the gutter. The drill I bought to bring up here with my doesn't have the power to gut anything, so I'm stuck doing it the old fashioned way until I can trade drills with my dad. If in doubt, electric drill every time! & less movement transferred to the hands as well! I broke down & ordered one of these too - can't wait to get my hands on it. Hopefully it arrives next week. Have an 18v cordless that i'm hoping will do the job. If not, have a 1/2" monster drill that usually is used with a 12" paddle for blending that i'm sure will do the job.